Ph.D. (Law), UGC-NET, PGDMHRD, LL.M., LL.B. 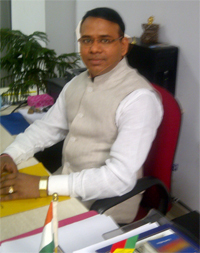 Dr. Prem Kumar Gautam joined this university in 2009 as a regular faculty. He has been teaching for last 8 years at the Masters (LL.M.) (2 years) and Graduate level [LL.B. (Hons.)] (6 years). He was conferred with the degree of Doctor of Philosophy by Babasaheb Bhimrao Ambedkar University (A Central University), Lucknow in the year 2015 for his thesis titled “Alternative Sexuality and Jurisprudential Morality: A socio-legal study”. He obtained his post graduate diploma on”Management of Human Resource Development” (2007) from the University of Lucknow in First Division. He did his Masters (LL.M.) in 2005 from the same university. He had qualified UGC-NET exam in June 2006. He has been awarded Rajeev Gandhi National Fellowship from UGC in 2007. He has 05 research articles to his credit published in Refereed Journals. He has participated and presented papers in more than 22 National and International seminars and many national and state level workshops, consultation and symposium. He has participated in winter and summer courses of Indian society of International Law, New Delhi. He has delivered more than 6 guest lectures on various topics of law. He has been invited by the IGNOU’s Gyanvani FM for a Live Phone-In programme on the topic of ‘Right to Sustainable Development’. Dr. Gautam guided several research students for their Post Graduate Degrees. He is having special interest in Human Rights and Conflict of Laws (Private International Law).